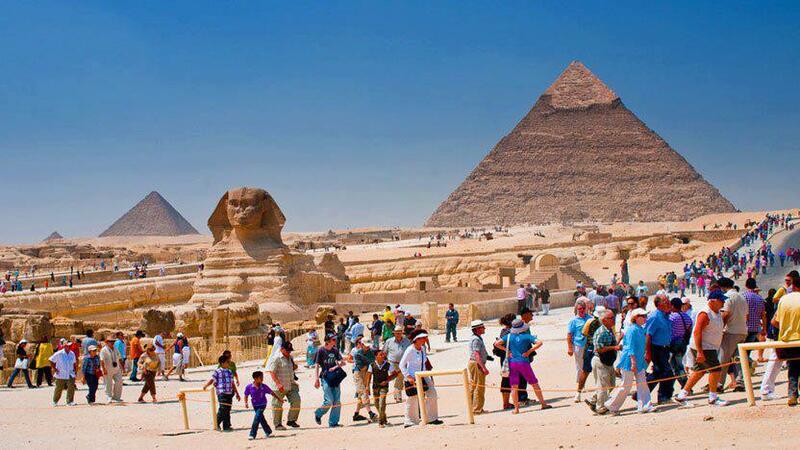 We will pick you up from Hurghada hotel and transfer to airport for the flight to Cairo, meet in Cairo airport then transfer with an expert Egyptologist guide to wander the Giza Plateau, the location of Egypt signature attraction. you will have time enough to explore the 3 Giza pyramids, the mysterious Sphinx and the Valley temple attached to Chefren pyramid. Get your lunch in the way to the world famed Museum of Egyptian Antiquities. Cairo Museum is designed in neoclassical style and exhibit collections over 120,000 items covering all historic ages of ancient Egypt including Tutankamon treasures. Move onto the Christian heritage community of Coptic Cairo to wander some early religious monuments, visit the hanging church named for its location on top the remaining tower of Babylon Fortress, stop also in Abu Serga church and Ben Ezra synagogue. Afternoon shopping opportunity in Khan El Khalili Bazaar the oldest market in Cairo & Middle East. You may optionally attend the amazing Sound and Light Show in Pyramids area before driving to airport, fly to Hurghada then drive back to hotel.